The mineral magnesium regulates over 300 enzymes in the body. It helps transmit nerve signals and relaxes muscles. Magnesium deficiencies are common in people with heart disease. 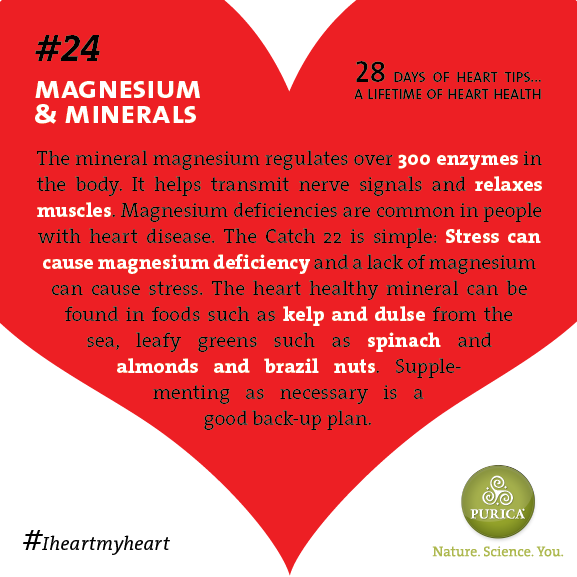 The Catch 22 is simple: Stress can cause magnesium deficiency and a lack of magnesium can cause stress. The heart healthy mineral can be found in foods such as kelp and dulse from the sea, leafy greens such as spinach and almonds and brazil nuts. Supplementing as necessary is a good back-up plan. This entry was posted in 28 Days of Heart Tips. Bookmark the permalink.